The powdered flower is used to increase the white blood cells in our body which fight colds and flu. My own personal experience with echinacea is so good that I recommend it all the time. It stops me getting worse when I’m run down. Come to think of it there are loads of herbal remedies which people find useful for different purposes. Schwabe make a product called EchinaCold, but they also make various other concoctions for migraines, depression, sleep problems, indigestion, coughs and stress… The list goes on. For those of us who prefer to use herbal remedies Schwabe make a useful source of medicinal treatments, all with the Traditional Herbal Remedy certification mark. 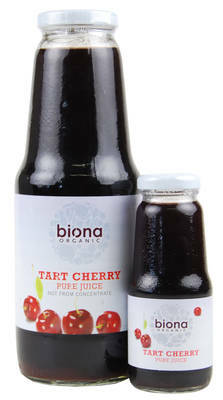 Biona have come up with a great tasting organic tart cherry juice that is full of goodness for your body. Did you know that cherries have at least 17 different antioxidants? They contain antioxidants called anthocyanins which make the cherries so red, but are also very powerful fighters against free radicals (molecules responsible for aging and tissue damage). Biona’s cherry juice is made out of five different types of cherries to ensure that you get the best from your juice and get the best out of you. And, if you are an insomniac tart cherries are also good for you as they are a natural producer of Melatonin which helps people fall asleep, stay asleep and wake up feeling rested and refreshed in the morning. But other than all of that… it tastes nice too! If you’re planning to lose weight in the new year but you haven’t got your sleep sorted you’re starting with a serious disadvantage. At least that’s my experience. If I don’t sleep my self control when it comes to food is wrecked. I just can’t stop feeling hungry. We need to be getting 7.5 hours of good sleep. If it’s not restful or it’s a shorter night, then the metabolism is slower and, chemically, you’ll feel hungrier – two great ingredients for a failed diet. And, when you think about it, the fact that you’re tired is also less likely to motivate you to get any exercise done. So, sort your sleep out first. A good night’s sleep increases the amount of leptin hormone in your body – which tells you when to stop eating. Less sleep means more of the ghrelin hormone which tells you to eat more! It’s a vicious circle, bad sleep = lack of energy = eating more carbs = lethargy = no exercise = restless sleep. It’s a good idea to learn some good sleeping habits. To help regulate your sleep (especially of you know you’re about to have a bad night) you may want to try a herbal sleeping aid. The use of natural ingredients such as hops, passion flower, valerian and lettuce makes a lot of sense to me – these are traditional ingredients well known for their ability to induce sleep and are used by a lot of other herbal companies. If by helping me sleep better it means they also help contribute to weight loss in the long run then that’s no bad thing. Did Mozart die from a lack of vitamin D? We’re learning more and more about how Vitamin D protects the body. But in the light of this comes a new theory about Mozart’s death. The musical genius died at the tender age of 35, and while he suffered many illnesses, the question of what he died from is still a mystery. Now however, two scientists believe that Mozart’s habit of composing at night and sleeping during the day helped lead to his departure. A vitamin D deficiency places a person at mortal risk from many of the illnesses Mozart suffered from. It’s difficult not to ponder that if only Mozart had had access to Vitamin D supplements he might have doubled his lifetime’s output of masterpieces. 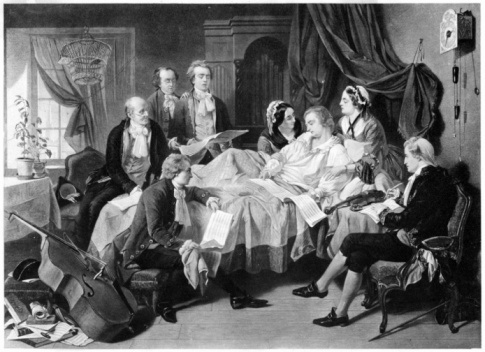 Mozart noted that most of his infections occurred between October and May. This also happens to be the time when people living in the higher altitude far north of Austria (as Mozart did) can’t make enough vitamin D from the sun. Studies link having adequate vitamin D with a lower risks of flu, pneumonia, heart disease, autoimmune diseases and more. It may just be that vitamin D supplements may help your health hit the right note. Jane Thompson, author of the Sleep Disorder Tips website has written some of her thoughts on getting a good night’s sleep. People who do not have issues with sleeping may feel that it is actually funny to have to learn how to sleep. But you only have to ask those who do not get a good sound sleep to understand that there can be problems with sleeping and that learning how to sleep is important for everyone. A good night’s sleep can help us feel refreshed and active. Those who sleep well are better equipped to take on the challenges that each day presents to us in the stressed life that we all lead. It is also more rejuvenating than any pill or vitamin you can take to feel better. While the benefits of a good night sleep may be known to you, you may still not be able to get a sound sleep. To learn how to sleep more soundly, check out the points that have been mentioned below. Happy and satisfied people sleep more soundly than others. If you have something that is bothering you, it might be difficult for you to get it out of your mind and get some sleep. While this is not a direct tip that includes eating certain foods of sleeping in a specific position, the fact is that if your mind is free from worry and apprehension, you will be able to get sound sleep. Staying healthy is a key to better sleep. Those who include some level of exercise every day are more prone to feel tired to just the right level to be able to sleep like a baby. Sleep does not evade them and they can ease themselves into bed and slip into sound slumber easily. Those who eat good nutritious food and exercise regularly are also less prone to physiological and psychological problems. A routine can help you sleep better! If you wake up at a specific time and then follow a schedule every day, you are likely to feel sleepy at the same time. It is all about the ‘circadian rhythm’ and if you are able to teach your rhythm to follow a specific pattern, it will become your slave. Otherwise you may become a slave to the idiosyncrasies of your circadian rhythm that might keep you awake for long hours in the night. Late night parties and late working hours can disrupt this schedule. While that may be necessary on some days, try and ease back into the regular schedule again. Positive vibes can help you sleep better and if you really want to learn how to sleep well, you should try and change your approach to life to make it more positive. Positive moods release endorphins that can make you feel relaxed and at ease, a body condition that is conducive to sleep. So ignore all the tips that you get about drinking milk, sleeping on your back or your stomach for that matter and concentrate of having a positive approach to life to be able to sleep better. For help in adjusting your sleep pattern visit our sleep aids and sleep teas sections at GoodnessDirect. Are you female and ever get leg cramps, foot pain or muscle ‘twitches’? Insomnia, migraine headaches or lack of energy? Chances are you could be deficient in magnesium. Are you female and find you are prone to hair loss? Or maybe you have poor skin, frequent diarrhoea; your sleeping is irregular and listless and your wounds take quite a while to heal properly? If any of this sounds familiar chances are you may have zinc deficiency. 80% of women are short of vitamin D.
60% of the over 65s are short of vitamin D.
All in all I’m off to get myself a good all in one nutritional boost. But that is not the total answer, our western diets mean that we consume too much salt and saturated fat at the expense of fibre, fruit and veg and foods that give us omega oils. There is never any replacement for eating a good and varied diet crammed with all that is good for us – fruit and veg, oily fish, nuts and seeds. These should form the foundation of our diets, but even then, poor soils and pollution mean even our fruit and vegetables can be nutritionally starved. So, what with that and our busy lives, maybe a little boost is needed. It certainly is for me. CherryActive Concentrate and capsules are well known for their benefits to sports people for joint mobility and muscle recovery, as well as aiding regular sleep patterns. CherryActive is, in fact a firm favourite and has been a well established nutritional supplement and well acclaimed anti-oxidant for a while. So what is the news? Cherry Active has recently been voted the best supplement for 2009. Acclaimed for the things mentioned above, CherryActive is made from the Montmorency Cherry, or Tart Cherry. It is processed using special techniques which optimise their powerful antioxidant properties. These tart cherries are such a rich, natural source of anti-oxidants and flavonoids that just 30ml of Cherry Active has been shown to have the antioxidant capacity of over 20 typical portions of fruit and veg. No wonder it was a winner.